Parents (p), sponsors (s), and the one baptized (bpt) are named in this index covering over a century of this congregation’s baptismal records (1869-1986). 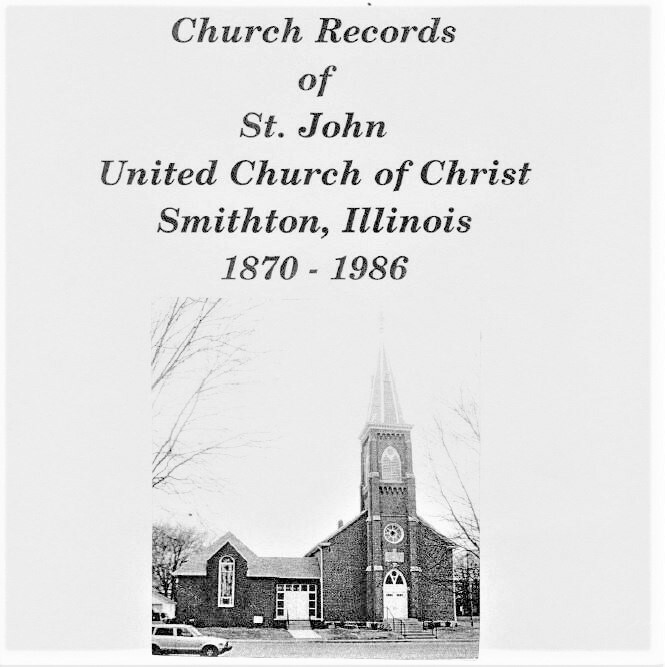 Church Records of St. John’s United Church of Christ, Smithton, Illinois, 1870–1986, includes full abstracts of all baptism, marriage, death, and confirmation records, was translated from German into English by Martha Mae Schmidt for the SCCGS. Death records very often specify the German or other place of birth and biographical information difficult to find elsewhere. A child’s birth date appears in nearly all baptismal records as well as in confirmations (through 1942). Baptismal records are a very reliable, independently created source of vital records preceding county-level birth registrations. As with most small town congregations, families are often interrelated. Genealogical clues lacking for one member might be found in records of a relative. SCCGS volunteers will provide photocopies from this book for a small fee (see Services).